Carey, Mariah — The pop singer dropped hints (in a “Radio Disney” interview, no less) that the current bun in her oven with husband Nick Cannon may be, in fact, plural when she proclaimed “I just hope they don’t turn out hating Christmas!” Twins for the Cannon-Carey marriage would be wondrous news, to be sure, but it should be noted that Carey already has a pretty impressive set of twins as it is. Hey-oooooooo! I am talking about her breasts. Christie’s — A full Darth Vader costume failed to sell at a recent auction of movie memorabilia held by Christie’s auction house in London, though a Walther air pistol used by Sean Connery as James Bond fetched $437,206 and a dinosaur model from the original King Kong was purchased for $39,000. Also unsold: a pair of briefs worn by Ernest Borgnine for an alleged nine straight days during the filming of The Poseidon Adventure. Fleiss, Heidi — After a Thanksgiving day fire ravaged the home of Heidi Fleiss, Hollywood’s notorious reformed madame says that though she lost her entire guest house and almost all her clothes in the $60,000 blaze — but that her twenty pet birds are all safe. We’re happy no one was injured in the fire, but we have to wonder why on earth someone would keep all those birds in a cathouse to begin with. 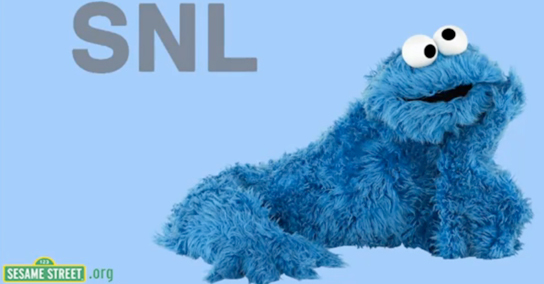 Monster, Cookie — Last week, Sesame Street’s resident pastry addict made a public plea to the producers of Saturday Night Live to let him host the show, even turning in an audition tape in which he played characters, hosted the “Weekend Update” segment and even impersonated Lady Gaga. If the campaign works, it would make Cookie Monster the first muppet host since Grover dropped the f-bomb on live TV during a Michael Dukakis sketch in 1987. Video Games, Movies to — IFC has put together a fairly interesting — and surprisingly well-researched — little list of 26 movies that should be video games. The list features some good ideas, including The Dirty Dozen, Kill Bill and Labyrinth, among others. Meanwhile, my petition to turn the Oscar-winning Anthony Hopkins drama The Remains of the Day into an action platformer continues to go unattended. English drawing-room period dramas are the new superhero movies, I tell you. Wilco — The beloved alt-country-rock band is teaming with Chicago’s Intelligentsia Coffee to brand and release its own brand of coffee called “Wilco Selects” in time for the holidays. And just as happens with Wilco, there will inevitably be one guy in your office who’s way too into it, won’t shut up about it and constantly tries to force watered-down bootleg coffees down your throat.